The point, presently lying in the constellation Virgo, where the Ecliptic crosses the Celestial Equator. When the Sun passes this point, on about 23 September each year, nights begin to grow longer than days, and continue to do so until the Winter Solstice in December. (In the southern hemisphere, this situation is reversed). 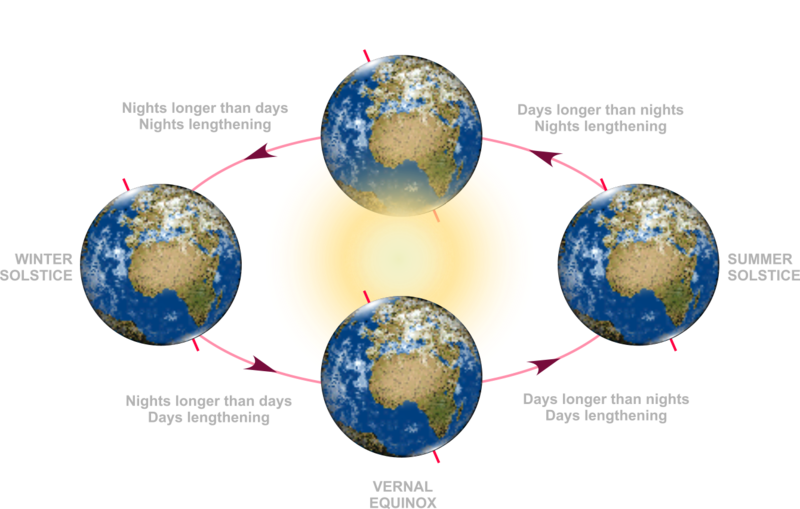 The Autumnal Equinox signals the end of the summer months and the beginning of winter. At this time of year, days have been shortening since the Summer Solstice some three months earlier, and the Equinox is the point where nights reach the same length as days. After this point, the Sun will shine lower and lower on the horizon until the Winter Solstice in about three months' time. Equinoxes occur because the Earth's axis of rotation isn't aligned with the plane of its orbit around the Sun: it tilts over by about 23½°. The direction of this tilt is effectively constant, relative to the stars, so that the Earth's north pole always points towards Polaris, the Pole Star, and the south pole always points at the constellation of Octans. (In fact, this direction is not completely constant, and the poles move against the stars by about a fifth of a degree every century). Each year, the Earth completes a circuit of the Sun, and for its poles to remain fixed against the stars, their direction must rotate relative to the Sun. This effect gives us the seasons. When a pole is angled towards the Sun, its hemisphere receives more hours of sunlight, and when a pole is turned away from the Sun, its hemisphere experiences long cold nights. Mankind has followed the cycles of the Sun for millennia. Stone circles like this, dating back more than 3,000 years, are aligned to the Solstices and the Equinoxes. The equinoxes represent the points where the direction of poles are at a right angle to the Sun. They represent the point of transition from summer to winter, or from winter to summer. The Autumnal Equinox occurs in late September, and is named for the fact that it marks the end of summer and the entrance into winter of the northern hemisphere. South of the equator, its name is less appropriate, since it corresponds to the beginning of summer, though for historical reasons the name autumnal tends to be used for the September equinox in both hemispheres.